Cool Planet Skiers had a beautiful day at the American Birkebeiner on Saturday, February 22. First time Birkie Finishers included Mindy Ahler and Dan Nolfi. 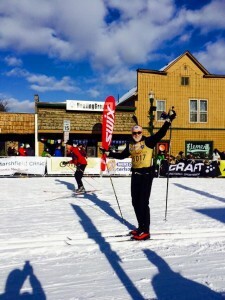 Repeat performances in the Birkie by Brett Cease (2nd), Paul Thompson (35th), Harold Teasdale (24th), Tim Jung (12th), Casey Englund-Helmeke (2nd) and Shawn Englund-Helmeke (2nd). Korteloppet finish by Nicole Rom (2nd). Prince Haakon finish by Pat Corcoran (2nd + 1 Korteloppet). A few photos below. More to come! 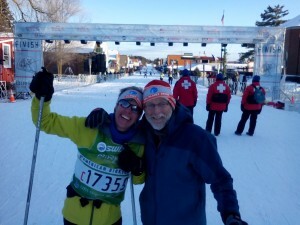 Paul finishing his 35th Birkie! 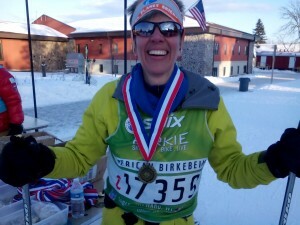 Mindy with her Medal after finishing her first Birkie!